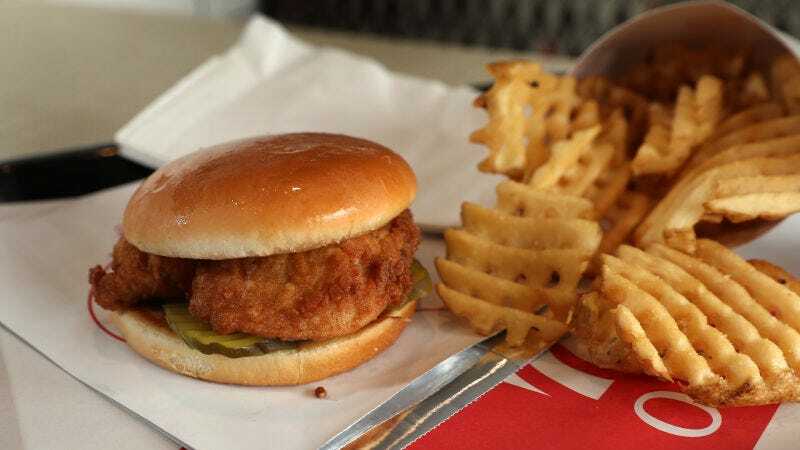 Chick-fil-A, the extremely popular fast-food chain, creator of our favorite fast-food sauce, and slinger of cult-status waffle fries, now delivers nationwide. That means you, Takeout reader, could be lounging shirtless on your cat-hair-covered couch, digging into a Spicy Chicken Deluxe—with waffle fries, obviously—without ever having to put on shoes or leave your home. What a time to be alive, etc. If you plan to place a Chick-fil-A delivery order—you’re doing it right now, aren’t you?—use code CFADELIVERY at check-out for a free chicken sandwich with your order. Chick-fil-A will only give away 200,000 of these freebies, though, so move your cat off your phone and get ordering.